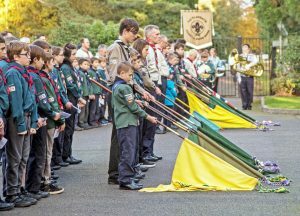 THE annual pre-Remembrance Sunday Brookwood Military Cemetery Last Post was held last Sunday in conjunction with Woking District Scouts. Tony Branagan, the former Mayor of Woking who is part of the Bookwood Last Post Association, said that special ceremony was about encouraging more young people to think about Remembrance Sunday. “In the past, the monthly Last Post ceremony at the Military Cemetery tended not to be held once autumn and winter set in,” Tony said. He said that Brookwood Scouts had been at Morrisons in Woking collecting for the Poppy Appeal. Tony, who was mayor from 2014-15, spent 22 years in the Army, serving in Germany, the Supreme Headquarters of Allied Powers Europe in Belgium and Hong Kong . The ceremony on Sunday was attended by several scout groups from around the borough and beyond, with music provided by the 1st Claygate Scout & Guide Band. A NEW Garden of Remembrance and 100 burial plots are to be created within Brookwood Cemetery. The works will transform a previously overgrown area of the cemetery. New planting and structural landscaping with carefully selected trees and shrubs, including a specimen Cedar of Lebanon, will reflect the historic nature of the Grade 1 listed cemetery. Gravel paths and 15 parking spaces will provide visitors with easy access to the garden. “Investment in this project demonstrates the Council’s commitment to restoring and improving Brookwood Cemetery,” said Cllr Ayesha Azad, the council’s Portfolio Holder for Asset Management. Brookwood Cemetery, which is separate from Brookwood Military Cemetery, opened in 1854 and is the largest in Western Europe. Since its opening, approximately 250,000 people have been laid to rest within its grounds.